Chicken Korma (Chicken in Rich Yogurt Curry) is a milder form of curry and is distinguished from other curries by its rich gravy and smooth texture, mainly because of its heavy incorporation of yogurt as part of its main ingredients. 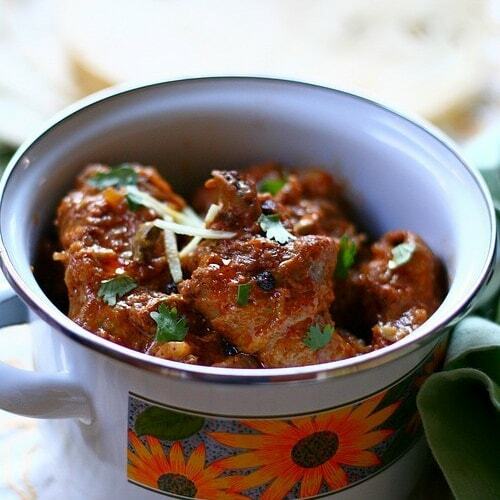 Chicken Korma – Yummy chicken in rich yogurt curry Indian recipe. Simple step-by-step with pictures to make an easy and hearty meal. For as long as I can remember, I have always been an avid admirer of Indian cooking, especially the amalgamation of spices involved in developing each unique curry. Procuring these spices from the local Indian grocery store always bring back fond memories of the “spice trips” mom and I used to take to the Little India in my hometown of Penang. The heady, robust fragrance of the variety of spices is inevitably what hits me first, sending images of juicy chunks of meat braising in a thick, rich, full-flavored curry to my brain as I try to hold back the drivel on the corner of my mouth while patiently awaiting mom to finish haggling with almost every shopkeeper along the street before my taste buds get to do the Bollywood boogie with the Chicken Korma and Squid Curry over a fluffy bed of basmati rice. Along with Chicken Tikka Masala and Butter Chicken, Korma is undoubtedly one of the more popular items that can be found on the menu of any authentic Indian restaurant. Korma, also spelled as Khurma or Kurma, is a milder form of curry and is distinguished from other curries by its rich gravy and smooth texture, mainly because of its heavy incorporation of yogurt as part of its main ingredients. Although it may seem like a complicated dish at first, what with all the different spices involved, Korma is actually not that difficult to master. The main thing is to tweak it to your fancy. Anyway, I hope you enjoy my take of this world-renowned dish of Indian origin – the Chicken Korma. It is definitely a “must try” dish for any gathering and I am highly confident that it will impress not only yourself, but also your friends and family as well. 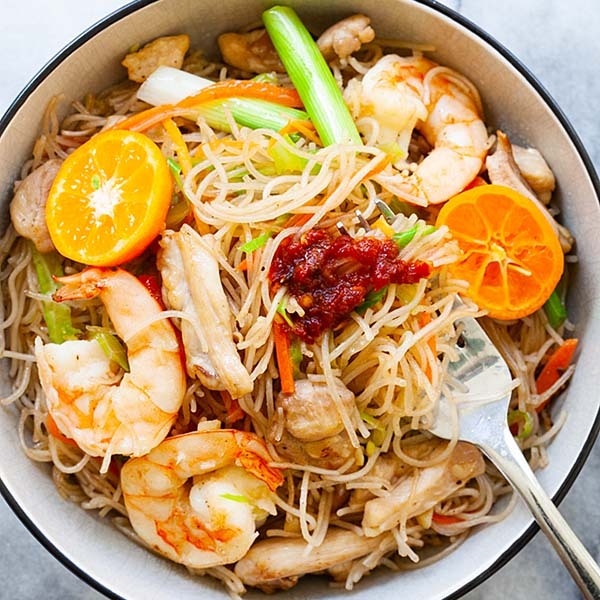 Heat up wok with 2 1/2 tablespoons butter, stir-fry the items listed under Ingredients and let the whole spices to sizzle a bit until fragrant. Toss in the marinated chicken (with the marinade) and continue to stir-fry for 10 minutes. Turn heat to medium-low, cover the wok and cook for 30 minutes, or until the oil slightly separates, chicken is tender enough and you have achieve the gravy consistency that you prefer. Salt to taste, and add some water if the dish appears to be too dry. Dish out and serve with basmati rice or Naan bread. Mutton, lamb, beef and vegetable makes delightful Korma as well. If you prefer, substitute yogurt with cream or coconut milk, or a combination of them. Fried onions can be substituted with fried shallots. To prepare fried onions at home, deep-fry finely sliced onions on high heat for 10 minutes or until color changes to almost translucent and crispy. Spread out on paper towels and pat dry. Love khorma..actually making a very easy version of it today. Yours looks great! Many thanks for providing such useful information. I absolutely thank you for professional approach. I must we appreciate you the efforts you have made in some recoverable format this post. I hope the same best work on your part down the road likewise. This looks really tasty. I always avoid kormas in restaurants becuase they are usually too heavy and creamy but I love homemade ones. I presume you put the chicken into the curry ingredients with all the marinade. It doesn’t mention that in the recipe. Marinate chicken with the Marinade ingredients. Then stir-fry items listed under Ingredients before tossing in the marinated chicken. Would it completely change the dish if I left out the cumin? I have an aversion to cumin the way some people do to cilantro. The dish sounds so good though, and not at all complicated! Tweak it to your own liking. Also, if you do not want it too spicy you can tone down the chili powder or if you feel the spices is bit much, use less amount is fine too. I love Indian food, and this looks delicious and not too difficult to make. Made this for dinner tonight. Yum!!! Yumm, now i have to make it soon. Being from the sub continent I can say that this is very close to the authentic korma recipe. Korma is a very special dish here and no wedding meal is complete without chicken korma! Yours looks absolutely gorgeous. 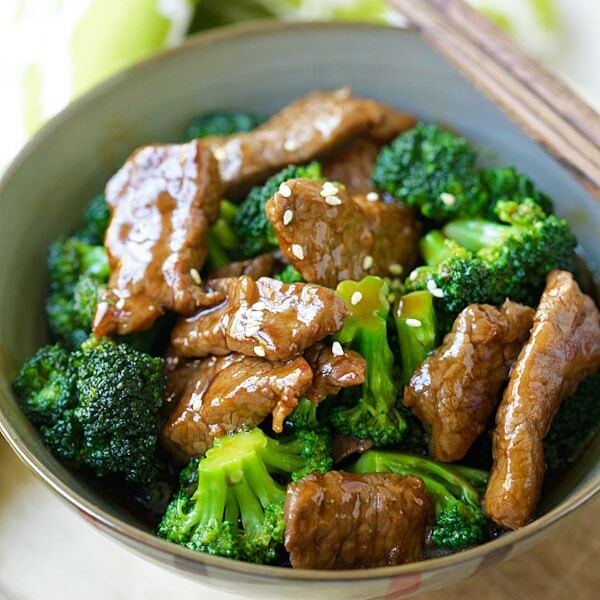 You still have not clarified if the marinade is discarded or added to the stir-fry. this is my husband’s favourite and i want to cook this for him. how many cinnamon stick to be used in this recipe? you mentioned 2″ cinnamon stick but how many? thanks for your help! One cinnamon bark is about 4-inch in length. I assume 1/2 a cinnamon stick is fine. Do you leave the cinnamon stick, cardamons, cloves and bay leaves in dish after it’s done? People eat those? Yes, you leave the aromatics in so that the flavor continue to sit in the dish. No, you don’t eat them. 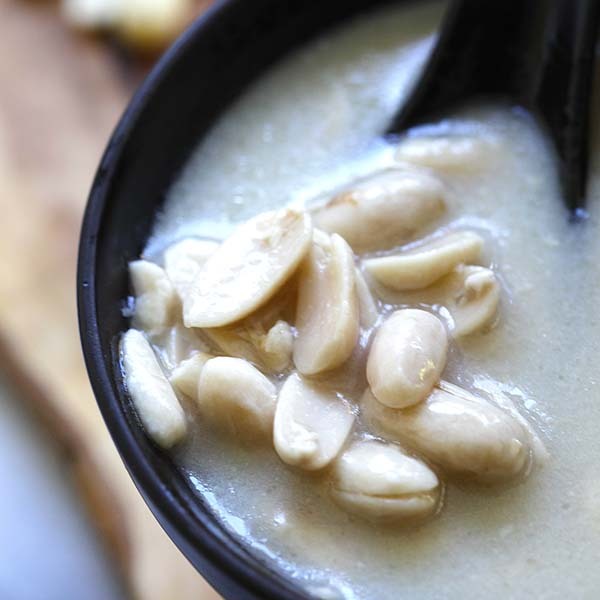 Looks different from the usual kurma we have here as it’s creamy color. Your recipe looks rich and I like that you use yoghurt as over here, we use coconut milk a lot which is not good for our cholestrol. Yoghurt would be a good choice. I’ll definitely make this for dinner this week! This looks so warm and yummy for a cold winter night! I’m a huge fan of yogurt-based curries and can’t wait to give this a shot. Thanks for the inspiration, Bee! Will definitely be giving this one a try. This looks delicious! Do you recommend dark meat or chicken breast for this recipe? Thanks! For this recipe, I used a cut up whole chicken, dark and meat all mixed, skin-on and bone-in. Its totally up to your preference. Just thought I’d mention, when I made it I used a whole chicken as well (sans wings), but I cut all the meat off the bone before marinading. Taste wise, I prefered the dark meat chunks to the breast chunks, but it was nice having both in there. One of my favorites! I really must get the nerve up to make Indian food at home from scratch…bookmarking this! I used green cardamom for this recipe. Either black or green is fine. This was delicious! I’m pregnant and have been craving Indian food like crazy, so I made this for dinner. I like my gravy thick and for whatever reason couldn’t get mine to reduce enough, so I just added a TAB or so of flour near the end, which thickened it right up. I would like to make this again for my husband but he insists that EVERYTHING he eat be ridiculously spicy. I found this recipe to be pretty mild. What would I add to make it spicy? Would using chili powder instead of paprika do the trick? Sure thing, using chili powder or fresh chili paste (soak whole dried chilies, remove seeds and blend it) will definitely make the dish spicier. Please, I am making this tomorrow. Do you fry the onions and then add them to the marinade and then proceed? Don’t the onions get a little uncrispy after you add them to the yogurt marinade?? Just asking as I think that’s the right order but just want to make sure. Can’ wait to hear back from you. Looks delicious! Thanks for your help. can i substitute heavy cream for the yogurt? I tried this recipe last night, but I’ve never cooked with yoghurt before. Is it supposed to turn to liquid and separate on the stir-frying step? Add cornstarch (corn flour) to the youghurt before anything else. This should solve your problem. If you’re yoghurt comes clumpy or separates add some cornflour (cornstarch) to the the yoghurt before making the marinade. A few weeks ago my wife bought about 8 pounds of yogurt of which I only used 4 pounds of so I needed some recipes before the other 4 pounds went bad. 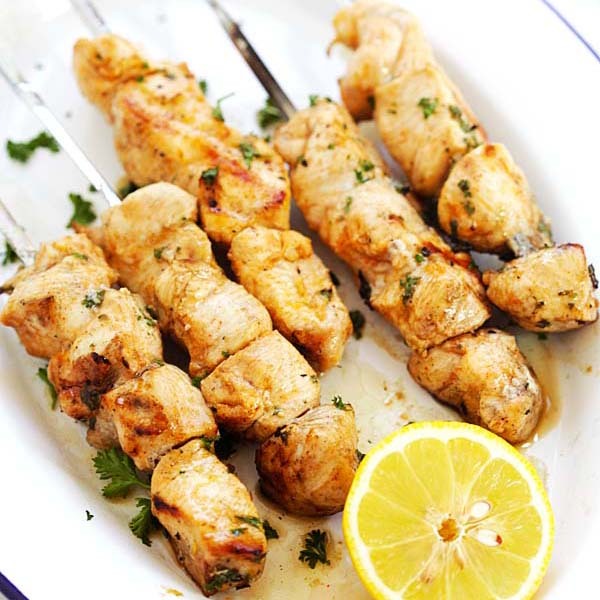 I was looking for recipes that used it as a marinade with chicken and I came upon this Chicken Korma. Originally I wanted to do the Butter Chicken, it is one of my favorite foods, but by the time we drove all over Dallas looking for both types of Masala it was tool late to let it marinated long enough so we settled for this recipe. It I doubled the portions and it was wonderful. We spooned it over basmati rice for a real treat. One question I did have though, how do you bruise a cinnamon stick? Tomorrow we will be trying the Butter Chicken. I’ve got the marinade already made and the chicken sucking it up in our fridge for tomorrow. I’d like to echo MollyCuddy’s question from 2012 re: the onions as I dont see a response. Am I including the onions or shallots in the marinade? Won’t they become rather soggy? Thanks for this recipe… It’s really delicious! I’ve cooked this twice and getting better at it. Do be generous with the spices (cloves, cardamom etc) as it gives the dish more depth. I added twice the amount. And yes, add the fried onions to the marinade. There is nothing that’s meant to be crispy in this recipe. Best with naan. Yumms! I used 1 1/2 tablespoons red indian chili powder as in the recipe and my mouth is burning and all I can taste is the hot, not the flavor even though I like some hot in my dish…? did you mean american chili powder? The recipe says 1 1/2 tablespoons chili powder or paprika, so yes it’s regular chili powder I get here in the US which is pretty mild and not hot. I am not sure about red Indian chili powder I have never used that.